Have you brought your child in for a ‘ride in the chair’? The first two years of a child’s life is a time of wonder, learning, and adventure – and that’s exactly how we approach dental appointments for kids. 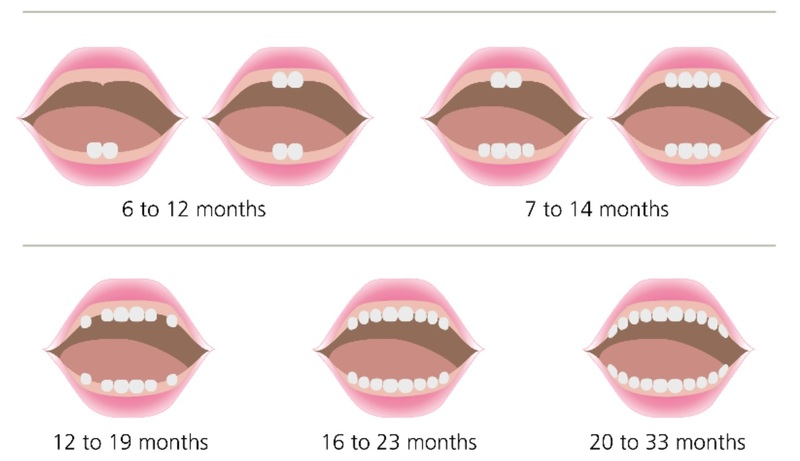 A vital time for both parents and children, we have put together this timeline to share some important dental advice for babies to children of two years of age. Did you know that by the time your child is born all twenty of their primary teeth have already started developing in the jawbone? Prior to the eruption of your child’s first tooth, you may wish to start by wiping their mouth with a damp cloth, once a day after feeding. At around 6 months of age your child’s first baby tooth should be appearing. These baby teeth are also known as primary teeth, and the teeth at the lower-front typically erupt first. A graphic guide to the eruption of your child’s teeth! Despite their eventual replacement by permanent teeth, it is important to know that these primary teeth are needed by your child for proper eating, speaking and growth. With such an important role in your child’s development, maintaining the health of these teeth is vital! We recommend the following products and home remedies to help your child through the teething process! Please be aware that any existing medical allergies should be discussed, and all directions from your GP, dentist and health practitioners should be followed before and during the use of any of these products. Used sparingly, teething gels can be a great way to take the discomfort away from sensitive teething areas. These teething gels contain active ingredients that directly numb the areas of the mouth in which it is placed. However, this numbing action may also affect your baby’s throat, taste and gag reflex, so close supervision is advised. Due to this numbing action, we advise that you check with your dentist before using teething gels regularly, as they may mask any underlying pain or discomfort. Is your baby already eating solids? Foods such as frozen cucumbers, grapes or watermelon are not too hard to cause injury, and are cold enough to soothe. A container such as a mesh feeder is perfect for these frozen foods. Otherwise, a clean wash cloth, teething ring or pacifier can be dampened and placed in the freezer for 15 mins. This is long enough for it to get nice and cold, but not to freeze. If you need something supplement your regular teething remedies, then a children’s pain reliever can often be a good second option for when pain increases or your child is in distress. While regular use should be avoided without speaking to a medical professional, these pain relievers can be particularly useful if the doses are scheduled for particular times of day. “If your child is experiencing more pain at certain times of the day, like before sleep or in the morning, pain relief medication can be a good way of helping your child stay pain-free and happy,” says Dr Alana Evans. As this first tooth appears, we recommend having an infant toothbrush at the ready so you can start looking after your child’s teeth straight away. Brushing should be done once per day after your child’s last feed. In most cases, moisten the brush with plain water and brush gently – there’s no need for toothpaste until the age of 18 months. “Children’s toothbrushes are specifically designed to have softer bristles and a smaller head. This lower abrasive quality and smaller shape is easier for you and your child to use,” says Dr Alana Evans. Dental health starts with early education and we recommend that you bring your child in for their first dental check-up between the appearance of their first tooth and their first birthday. “The sooner your child becomes acquainted with the dentist, the better. For our younger patients, we often describe these first dental appointments as a ‘ride in the chair’ and try to keep it friendly and fun,” says Dr Alana Evans. These appointments are a great way of starting a child’s relationship with their dentist, and we really just want to take a look and make sure the teeth are erupting normally. It is also a great opportunity to answer any questions about your child’s oral health, or to talk to your dentist about any problems you or your child may be facing. As your child grows, continue to use a small brush and remember that only gentle brushing is required (and don’t forget the gums too!). As long as your child is cooperative, you may gradually increase brushing time to two minutes. If you are having problems getting your child to brush or they are finding it uncomfortable – try to keep brushing time to a manageable length, and slowly build it as their familiarity increases. There are several products that may help them become more interested in brushing such as brushing apps, timers and songs. A child’s toothbrush is just like an adults and should be replaced once every 3 months. This will help stop the spread of unhealthy bacteria, and ensure that the brush retains its shape and cleaning effectiveness. From 18 months of age, a small smear of children’s toothpaste should be applied to your child’s toothbrush to get them familiar with the taste of toothpaste. “Many parents are not aware that children may not enjoy the feel or taste of toothpaste, so we try to gradually introduce them to it.” says Dr Alana Evans. Children’s toothpastes are specifically formulated to contain a lower level of fluoride that is safer for kids, and often have a child-friendly taste. As your child’s comfort grows, we can begin to increase the amount of children’s toothpaste – but increase gradually as some kids tend to swallow a lot of toothpaste. The goal is for them to gradually increase the amount used to the size of a pea by the age of two. “It is important to teach your child how to rinse and spit out any toothpaste left after brushing, and ingestion should be avoided – but parents shouldn’t worry as small amounts are inevitably going to be swallowed,” Dr Evans continues. The most important thing you can do as a parent, is encourage and motivate your child to understand the importance of good oral health. If you are ever uncertain about any aspect of your child’s oral health we welcome you to call us. Water is the best thing for your baby’s bottle, particularly after meals and before bed. Drinking water helps to maintain a healthy environment in the mouth, and will dilute and wash away a large proportion of the residual sugar and acid that remains after eating. “Water helps to balance the pH of the mouth, and ensures that the right conditions are present for remineralization. This process is the body’s way of protecting teeth and preventing decay,” says Dr Alana Evans. What's in your child's bottle? There are two main types of drinks that you should be wary of putting in your baby’s bottle, sugary and acidic ones. These types of drinks are harmful for teeth, particularly whenever the liquid stays in contact with the teeth for a prolonged period of time – such as leaving the child with the bottle before bed or in between meals. Drinks to be wary of include soft drinks, cordials and sweetened milks – but we also need to be mindful to minimize the damage caused by healthy foods that contain natural sugars and acids, like fruit juices. You can read more about some of the dental danger foods for kids here! Are you in an area with fluoridated water? Did you know many Australian water supplies have naturally occurring fluoride? Throughout the day your enamel is constantly weakening, and strengthening, through a process called demineralization and remineralization. Fluoridated water typically provides enough fluoride for this process, but people who have rainwater tanks, or are in an area without water fluoridation may wish to seek alternative supplements. These come in many forms, and your dentist can advise which suits your family’s needs, with some of the most common being fluoride tablets and mouthwashes. “Fluoride is an important mineral for the preservation of healthy teeth, and plays an important role in strengthening the teeth via remineralization. Regular contact with fluoride is beneficial for your teeth and prevents decay,” says Dr Alana Evans.